Have Bill Gates and his eugenicist foundation’s crimes against humanity finally caught up with him? If the Supreme Court of India has anything to say about it, he will face the ramifications of poisoning millions of Indian children with vaccines. “While fraud and corruption are revealed on almost a daily basis now in the vaccine industry, theU.S. mainstream media continues to largely ignore such stories. Outside the U.S., however, the vaccine empires are beginning to crumble, and English versions of the news in mainstream media outlets are available via the Internet. All four of these organizations will now be expected to explain themselves due to a writ of petition originally submitted to the Supreme Court of India in 2012, by Kalpana Mehta, Nalini Bhanot, and Dr. Rukmini Rao, which has finally been heard by the courts. Furthermore, though absent from most mainstream U.S. media outlets, the Economic Times of India published their report in August 2014, stating that young tribal girls were tested with HPV vaccines. This involved not a handful of children, but 16,000 individuals in Andhra Pradesh, India, where they were given the Gardasil vaccine. KP Narayana Kumar reported that within a month of receiving the vaccine, many of the children fell ill, and by 2010, five of them had died. Another two children were reported to have died in Vadodara, Gujarat, where another 14,000 tribal children were vaccinated with another brand of the HPV vaccine, Cervarix, manufactured by GlaxoSmitheKline (GSK), who incidentally, has been accused of dumping polio virus into a Belgium river. Consent forms to administer the HPV vaccine were ‘illegally’ signed by wardens form youth hostels, showing that the Gates’ prey on the indigent without parents. For those who had parents, most were illiterate, and the true potential dangers of the vaccines were not explained to them. SAMA, an organization in India which promotes women’s health discovered this insidiousness, and reported it, but only now will Gates and his cronies have to answer for their misdeeds. Approximately 120 girls reported epileptic seizures, severe stomach cramps, headaches, and mood swings, of those who did not die. Other girls receiving the Gardasil vaccine have experienced infertility. “The SAMA report also said there had been cases of early onset of menstruation following the vaccination, heavy bleeding and severe menstrual cramps among many students. The standing committee pulled up the relevant state governments for the shoddy investigation into these deaths. 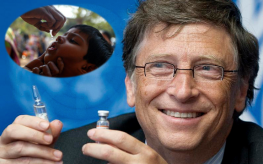 The Bill and Melinda Gates Foundation declared their little vaccine project a total success. I guess the Supreme Court of India will decide that now. The Copenhagen Wheel Official Product Release!